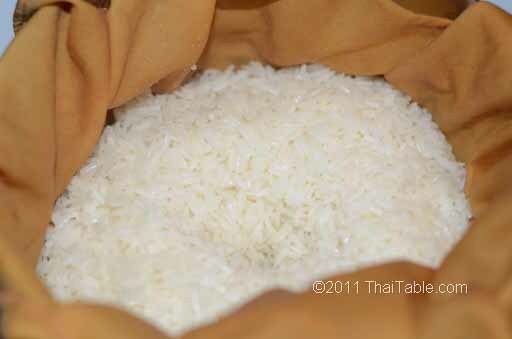 Thai people in the northern and northeastern regions eat sticky rice (also known as sweet rice or glutinous rice) in place of long grain rice. It is eaten with your hands by making a little ball and dipping it into other dishes. While most people used to make it with a steamer, the microwave seems much easier. The grains come out a little stickier, but unless you are eating with your hands, you barely notice. When you choose your rice, make sure you buy and use sticky rice. Sticky rice is not jasmine rice. If you try to cook jasmine rice this way, it will cook, but it will not taste or feel like sticky rice. Sticky rice has whitish grain as opposed to opaque like jasmine rice. There is a special bamboo steamer that people in northeastern Thailand use, but you don't really need one. All you need is a western steamer or a bowl you can set in a larger pot and some cheesecloth. When steaming sticky rice, it's important to move the rice around so that the rice gets evenly cooked. The microwave method is perfect for Mango on Sticky Rice. The Traditional Method Using a Steamer: Soak the sticky rice in enough cold or lukewarm water to cover the rice for at least an hour or even overnight. Take your steamer, put water in the bottom and cover the steam section with cheesecloth or muslin cloth. 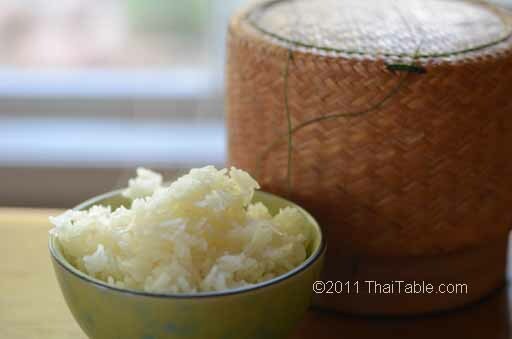 Pour the sticky rice on the cheesecloth, cover with the lid and put it on the stove on medium to high heat. Ten minutes into it, move the rice around so the top is down close to the steam. The sticky rice should take about a 20 minutes of steaming to cook and will become translucent when done. Take a small bite to see if it is soft and chewy. It should not be soggy. Soak the sticky rice for 10 minutes in warm water in a bowl. Soaking the rice is very important. I have tried this method without soaking the rice first and it was disastrous. The rice was undercooked and inedible. The water level should be just above the rice, which comes out to be 1 cup of rice and a little over 1 cup of water (about 10% more). I recommend using a non-plastic container because you may melt the plastic in the microwave. Cover the bowl with a dish and cook in microwave for at full power 3 minutes. Stir the rice around to move the rice from the top to the bottom. 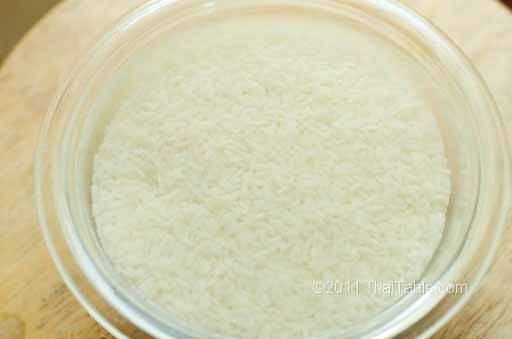 You will notice that some of the rice is translucent or cooked and some still has white center or the uncooked portion. Cooking sticky rice in a rice cooker seems to be the easiest way but it doesn't yield the best result. There is no need to soak the sticky rice. You just add sticky rice and water, according to manufacturer's instructions. Press the button and wait for 30-45 minutes depending on your rice cooker. When done, the sticky rice is mushy which is fine for mango sticky rice but not that great if you're planning to eat it with your fingers as a savory dish. The grains should be seperated and remain intact. In a pinch, this method makes sticky rice but not the best textured sticky rice. In Thailand, sticky rice is served in a bamboo basket. Enjoy sticky rice with laab, green papaya salad, bamboo shoot yum, nam tok, beef jerky, heavenly beef and grilled chicken with turmeric and a plateful of fresh vegetables.